Do you make sure your children get a good breakfast each morning? Makes sense. Who wants to think of the fruit of their loins going hungry? But you might also have been influenced by research that showed that kids who eat before going to school perform better academically than those who don't. Don't use this as an excuse for skipping each morning's pre-school meal, but that research didn't actually reveal a causal link between eating breakfast and academic achievement, at least when it comes to children who aren't clinically malnourished. According to Stats.org, subsequent studies revealed that it's tardiness and absenteeism that tend to cause poor learning experiences. In fact, the breakfast/good grades link is just a correlation: turns out that the sort of parent who packs his or her kid off to school hungry is also the sort of parent who doesn't much care about lateness or playing hooky. This distinction plagues statisticians. You can often show that there's a statistical link, a correlation, between A and B, but it's much harder to prove that A caused B. For example, advocates for family values often point to research that suggests that children usually do better in households with two parents. But might it be that the sort of people who make good parents are also the sort of people who get married and stay together? Or is it the marriage ceremony and certificate that affect behavior? There's no way I'm going to get involved in that argument. I am, however, happy to put my two cents into a discussion of the link between knowing about financial matters and managing one's finances well. I'm not suggesting that there's absolutely no causal link. Clearly, those Amish teenagers on "Rumspringa" (a period when Anabaptist Christian adolescents are encouraged to explore the pros and cons of modern America) who have been sheltered from the more predatory inclinations of our financial sector might fare badly as a result of their naiveté and ignorance. Who, among your family, friends, neighbors and colleagues doesn't know this stuff? Who do you know who needs to be told by ACA: "Keep in mind that purchases on credit will need to be repaid at some point in the future?" Anyone? Really, anyone? Few people run up credit card debt because they're financially illiterate. They do so because they're wildly optimistic about their ability to pay it back easily, or because the prospect of having to do so seems so distant that they don't care. If you're one of those lucky people who are naturally good at managing your money, then this is your cue to condemn their stupidity. But it's not only stupid people who get themselves into financial trouble. Twenty years ago, I was living in London, England. One of my best friends at the time was Tarquin (yeah, like I'm going to give you his real name), a 40-something law school professor, and about the most clever man I've ever met. He had two master's degrees from Cambridge, was at the time doing a London University part-time degree in Pure Math (because he "wanted a challenge"), and "for fun" used to read ancient Greek classics. In the original ancient Greek. One day, Tarquin (still not his real name) called me to say that he was moving out of his apartment and needed somewhere to stay for "a few days." Could he use my partner's and my spare bedroom? That was no problem, and he moved in 48 hours later. Nearly three months after that, my partner suggested, somewhat forcibly, that I should explain to Tarquin that it was time for him to move on. A week later, I was driving him to his next residence, and he said: "Thank you so much for putting up with me for so long. I was totally broke, and would have had nowhere to go if you hadn't helped out." Honestly, I had no idea he was desperate, and he would have been welcome to stay with us for as long as it took him to get his life back on track if only he'd explained his predicament. But that car journey included a revelation, an epiphany: the cleverest man I'd ever met was arguably worse than dumb old me at managing financial matters. And it certainly works the other way. Many very ignorant and stupid (and tasteless; just Google "McMansions") people become extremely rich. So this is a plea. 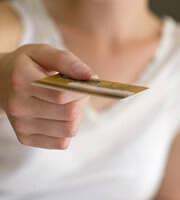 Don't automatically equate unmanageable credit card debt with ignorance and stupidity. Tarquin is far from the only example of someone who's supremely well educated and brilliant who's found himself struggling with his finances. Maybe your friend, grandchild, cousin or colleague isn't as clever as Tarquin, but that doesn't mean you should despise him for finding himself up to his eyes in debt. Or her eyes; actually, it may be women who are more likely to face credit card debt problems, according to a recent study from the FINRA Foundation. There may be correlations between problem debt and financial illiteracy, but there may not necessarily be all that many proven causal links. So don't be too quick to judge. However, do, no matter what the evidence says, keep providing breakfast for your kids. They may not do better at school, but they'll probably love you more. 0 Responses to "Making a financial mistake doesn't make you stupid"